You are here: Home » Blog » Financial Keynotes » Sessions sold out! Today I did two sessions for ISM International’s annual conference (Instititute of for Supply Management). We’ve been at this conference for four years, and our sessions are always filled on a pre-registered basis. It’s a bit weird to see people who did not register lining up to get into the session if there are no shows – not what one might expect for a finance session! Each session was full with about 250 people. There is always lots of good debate and discussion with this group. After the first session an attendee approached me. He told me that a few years back he received an MBA from Wake Forest. 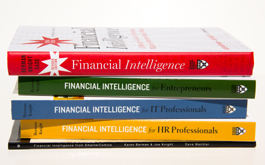 His finance professor, formerly from Harvard, required that, before taking his class, everyone read our book, Financial Intelligence. He told the students that if they didn’t understand basic finance after reading our book, they had no chance in his class. Over the years I’ve run into others who have used our book in undergraduate and graduate classes. It’s interesting to see where it pops up from time-to-time. Since I was staying overnight in Baltimore and traveling on the Charlotte, NC on Wednesday for a session with the Goodrich Leadership forum, I decided to grab a ticket and attend the Baltimore Oriole vs. Texas Ranger game at the beautiful Camden Yard stadium. I love going to major league baseball games when I am alone on the road. I can get a single ticket cheap through stub hub, and being the finance geek that I am I can buy a program and keep score during the game. I was lucky enough to get a deeply discounted single ticket in the 2nd row right behind the Ranger’s dugout. Guess what game was on Tuesday May 8, 2012 at Camden yard…. It was the game where Ranger Josh Hamilton became the 16th player in major league history to hit 4 home runs in one game. Last time that happened was in 1993. It happens about once every ten years. So with about 2,340 regular season games a year, that milestone happens once in about 23,340 games. Pretty cool! Josh Hamilton also hit a double against the wall on one at bat that was not a home run, so for the game he had 18 total bases. That was an all-time record for the American League. I’ll save my score card to prove I was there!